Former Lincoln City footballer Adam Buckley has been sentenced to 120 hours of community service after admitting stealing from other players at Sincil Bank. He pleaded guilty to four counts of theft when he appeared before Lincoln magistrates on Friday. The 23-year-old stole a pair of trainers, a pair of football boots, a mobile phone and a watch between August 2001 and January this year. Buckley is the son of former Imps manager Alan Buckley. 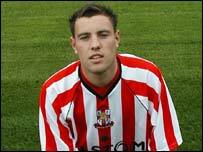 He joined City from Grimsby Town in July, 2001, but was not a regular first-team player last season.